Our SOA Mentoring offering is structured as a program that let’s you tap into the knowledge and hands-on expertise of our consultants on demand. Whenever you are facing critical decisions in your SOA project or you staff is overloaded and cannot meet project milestones on time, we will be ready to assist you. 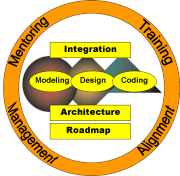 We act as mentors that back you up at any stage throughout your entire SOA project.